Incline cleated belt feeders are designed feed bulk solid items such as caps or parts. Incline cleated belt feeders are designed with an inclined conveyor belt with cleats which conveys the product up to the conveyor to a pre-determine discharge height. Bulk solid product is contained within the hopper of the incline cleated belt feeder. As the cleats pass through an opening in the bottom of the hopper, product falls between the cleats and is carried up the conveyor frame by the cleated conveyor belt. The cleated conveyor belt wraps around the conveyor frame at the top of the incline cleated belt feeder at which point the product held between the lugs drops from the top of the inclined cleated feeder due to gravity. Incline cleated belt feeders are often used to feed sorting equipment such as sorting bowls. Dual lane feeder equipped with 4-1/2"L x 9-1/2"W x 14"H cleats, and 192"L x 12"W conveyor belt, two 10"L x 10"W separate discharge ports 10"H which both discharge a S/S rails. Stainless steel, incline cleated belt feeder. Equipped with 316" long x 16" wide neoprene belt conveyor, with 13" wide x 4" high cleats on 12" centers. Horizontal floor run of 56" to a 211" vertical lift to a overhead horizontal top run of 48" and 230" discharge height. Stainless steel, Z style bucket elevator. Number of lbs of product per hour – depending on materials and application. Equipped with white flexlink belt with inside dimensions of 11" long x 3" wide x 1" deep, set on 6" centers, has 60" long horizontal floor run with a 28" in-feed height to 126" vertical lift with a 24" wide frame, to 36" overhead horizontal top run and a 165" discharge height. Powered by a 1 Hp side mounted motor drive with on/off switch. Mounted on stainless steel base frame. Stainless steel, bulk feeding system. Equipped with a 8 ft³ product hopper, twenty 48" long x 2" wide shuffling flights feeding into an eight lane indexing discharge system with twenty 48" long x 2" wide shuffling flights and variable speed controls. Mounted on height adjustable legs. 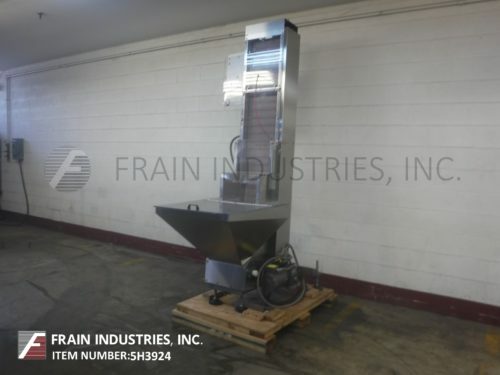 Incline cleated 192"L x 24"W neoprene conveyor equipped with cleat dimensions of 2-1/4"L x 21-1/2"W x 4-1/4"H and a discharge chute at 4"L x 17"W with a in feed height of 20" and a discharge height of 62". Also features with Lexan guarding, pull cable E-stop, adjustable casters, adjustable screw legs and slight angle adjustments. Stainless steel, inline cleated feeder with hopper. Equipped with 20 cu ft hopper, 14" wide cleated conveyor, 47" discharge, 10 by 1-1/2" cleates on 14 centers. Mounted on stainless steel frame wtih casters.